This October will see the release of Halloween, the back-to-basics franchise reboot from unlikely writer/director pairing David Gordon Green and Danny McBride, a modern-day a modern-day sequel to John Carpenter’s original Halloween which follows up with Laurie Strode (Jamie Lee Curtis) decades after she was the sole survivor of a massacre in her small Illinois hometown which saw her teenage friends slaughtered by a masked killer. In the trailers for the new film Laurie is clearly haunted by the memories of that night, almost certainly suffering PTSD, and has armed herself in preparation for the murderer’s imminent return. If all that strikes you as strangely familiar, it’s because that synopsis isn’t a million miles away from that of Halloween H20: 20 Years Later. Created to coincide with the original’s twentieth anniversary, and riding the cresting wave of the post-Scream slasher revival, H20 also coaxed Curtis back to the franchise after four sequels without her, centring the trauma of her OG final girl Laurie and ignoring everything that happened after Halloween II. With the forthcoming new reboot also doing a continuity wipe — in this case, everything after the original Halloween, including H20, is no longer considered canon — and the film’s own twentieth anniversary, what better time to look back at the legacy of Halloween: H20? How do you make a Halloween sequel twenty years after the fact? 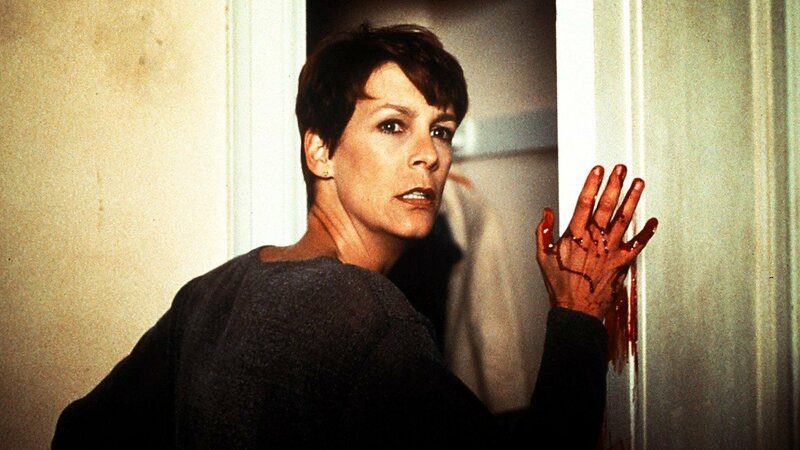 H20 takes the most thematically rich path by showing us Laurie Strode alive and well and living in California. She has a cushy job as headteacher of a private boarding school, enjoys a close relationship with her son John (Josh Hartnett), and is fanning the embers of a burgeoning romance with soft-spoken guidance counsellor Will (Adam Arkin). She has also faked her death and has a new identity, is separated from the “methadone-addicted” father of her son, has recurring nightmares which require a medicine cabinet full of prescription bottles to smother, and literally sees Michael Myers in every reflection, behind every corner, in every cabinet. Before it gets down to the brass tacks of being a perfectly serviceable mid-nineties thriller H20 is almost a straight drama about living with trauma. Enough of all that namby-pamby emotions stuff though. What about the murder? Well thanks to the strong performance of the whole cast, including the doomed teens who tow the same line as the original’s between authentically obnoxious and naive, you really feel for them when they kitchen knife starts a-slicin’. Eliding the flashier, frenetic editing and CGI-assisted bloodbaths of the era, H20 takes its cues from the original Halloween. It’s all about tension, shadows, and catching figures out of the corner of your eye. Of course the big change here is that the boogeyman is not only after kids: he’s hunting grown-ups now, too. In fact the most nerve-wracking sequence might be the one that brings the adult and child worlds together, as Michael sneaks in after a mother and daughter into a roadside bathroom, the mother glimpsing The Shape through the crack in the stall door, but completely frozen in place, even as she fears for her daughter’s life…a masterclass in horror filmmaking, and nary a drop of fake blood is spilled. Having single-handedly revitalised the slasher genre between the screenplays of the self-referential Scream and urban legend-riffing I Know What You Did Last Summer, Kevin Williamson was tapped by to pen a treatment for Halloween 7. The final screenplay is credited to Robert Zappia and Matt Greenberg, who jettisoned a lot of the more blockbuster-y aspects of Williamson’s take (such as the film culminating with a helicopter chase) and attempts to stick to the continuity of Halloweens 4-6. The Scream creator — who included plenty of references to Carpenter’s original in his film, making this a real postmodern ouroborus — is nonetheless apparently responsible for a lot of the interactions between the teenage actors, which are amongst the film’s strongest moments. Some of the more surprising figures behind the scenes include director Steve Miner, who started his career directing Friday the 13th Parts II and III, the Voorhees films beginning as shameless rip-off of the original Halloween. 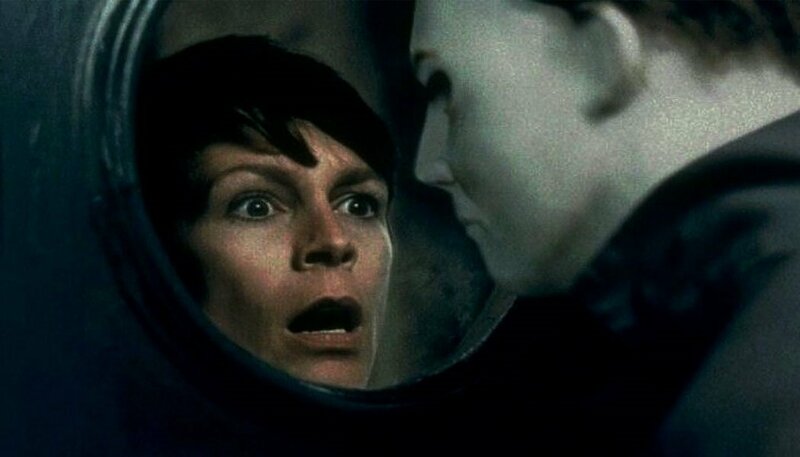 Despite the solid premise and amount of talent on board, Halloween H20: 20 Years Later is not particularly well regarded in the canon of The Shape. It was certainly an improvement on The Curse of Michael Myers (which revealed a celtic cult was behind Myers’s immortality and evil, and co-starred a pre-fame Paul Rudd), with a tepid response from critics and its relatively impressive box office later outstripped by Rob Zombie’s extricable remake of the first film. A further stain upon the film’s lasting reputation which proves difficult to get out is it was successful enough to warrant a sequel. 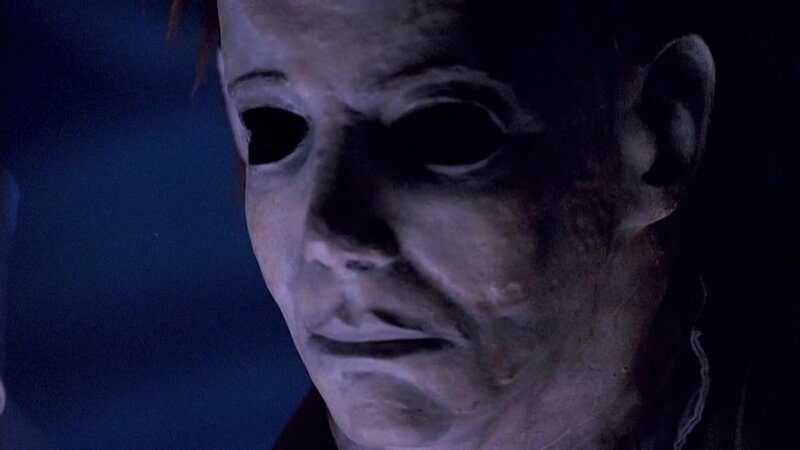 After a final scene which brings the series to a natural close, with emotional catharsis for Laurie in the form of lopping her homicidal brother’s head off, 2002’s Halloween: Resurrection opens with the reveal that Michael switched places with a paramedic mere moments before said beheading. Therefore the next film opens with a guilt-stricken Laurie, having killed an innocent man, in a mental institution. After an opening ten minutes where the real Michael returns and offs her (thus shoving Curtis back out of the franchise she had only just tentatively dipped her toes back into), with the rest of the movie consisting of The Shape hunting stupid teens who are hanging around in his old family home for an internet reality show. At one point, Busta Rhymes kick him through a wall. Which sounds hilarious, and it is, but it rather undoes all the good work of Halloween H20: 20 Years Later. The floor all is yours, new Halloween. Don’t let us down.